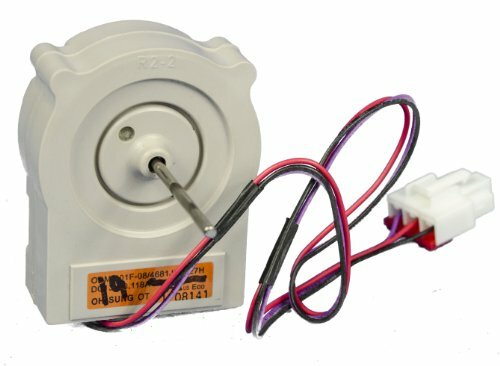 LG 4681JB1027H Refrigerator Evaporator Fan Motor. For use with the following LG Electronics models: LFD25860ST, LRFC21755ST, GRF258JBTA, GRF258JVTA, LFC25760SB, LFC25770SB, LFC25760ST, LFC25770ST, LFC25760SW, LFC25770SW, LFC25760TT, LFC25770TT, GRB218JSAA, GRB218JSCA, LFD25860SB, GRB218USAH, LRFC25750SB, LFD25860SW, LRFC25750ST, LFD25860TT, LRFC25750SW, LRFC25750TT, GRF258JSKA, LRFD25850SB, LRFC25750WW, GRB258JBAA, GRB218JTAA, GRB258JVAA, LRFD25850ST, LRFD25850SW, GRB258JQCA, LRFD25850TT, GRB258JVCA, GRB258UQAH, GRB258UVAH, GRF258JSTA, LRFD25850WW, GRF258JTKA, LFC21760ST, LFC21770ST, LRFC21755SB, LFD21860ST, GRF258JTTA, GRF218JSKA, LRFC21755TT, GRB218JVAA, GRB258JSAA, LRFD21855ST, GRB258JSCA, GRB258USAH. Refer to your manual to ensure ordering the correct, compatible part.